Air pollution is a serious concern for China. National levels of fine particular matter are well above recommended standards, and the average concentration across China’s thirteen largest cities is 30% higher than the national average. This column examines the relationship between health spending in China and air pollution, showing that health spending increases significantly during the two months following exposure to air pollution. A reduction of fine particular matter by about 20% from the current level could result in annual savings of 60 billion yuan in healthcare expenditure. Due to increased pressure from economic development and lax environmental regulations, developing countries, and especially emerging economies such as China and India, are experiencing the worst air pollution in history. According to the global urban ambient air pollution database compiled by the World Health Organization (WHO) in 2016, the top 20 most polluted cities in terms of final particular matter (PM2.5) are all in developing countries, including China, India, Iran, Pakistan, and the Philippines (WHO 2016). An alarming 98% of cities in low- and middle-income countries with more than 100,000 residents fall short of meeting WHO air quality guidelines. As urbanisationcontinues and development pressure increases, air pollution could further deteriorate. This is of special concern given the size of the population in these countries and the lack of access to adequate health care. 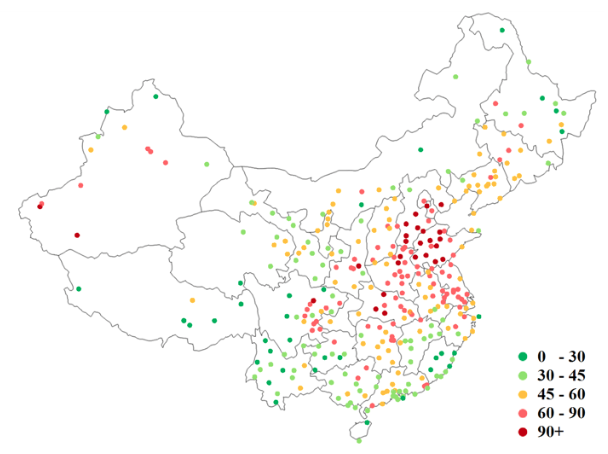 Figure 1 maps the three-year average level of PM2.5 for major Chinese cities from 2013 to 2015. The nationwide average is around 56 μg/m3, and the air pollution for most cities is substantially worse than the annual standard of 12 μg/m3 set by the US Environmental Protection Agency (EPA), or the standard of 35 μg/m3 set by the Chinese Ministry of Environmental Protection. Among the 13 largest cities with a population greater than 10 million, the average PM2.5 concentration is 73 μg/m3, 30% higher than the national average. Notes: The WHO guideline for annual PM2.5 level is 10 μg/m3; US EPA annual standard is 12. A rich literature from epidemiology and, more recently, economics has consistently shown a positive correlation between exposure to air pollution and an increase in mortality and morbidity risks in developed countries (Brunekreef and Holgate 2002, Pope and Dockery 2012). These findings have provided guidance on air quality regulations such as setting or tightening ambient air quality standards. Studies on the health impacts of particulate matters, for example, have led the US EPA to establish standards for PM10 in 1987 and for PM2.5 in 1997 (Dockery 2009). While policymakers in developing countries are increasingly aware of the negative impacts of air pollution on human health and the quality of life, and have been adopting various environmental regulations, few such policies are based on rigorous empirical analysis using data from developing countries. Instead, estimates of the dose-response relationships between pollution exposure and health outcomes using data from developed countries are often used as inputs for evaluating environmental regulations in developing countries. This is problematic given that the air pollution level in urban centresin developing countries is often an order of magnitude higher than that observed in developed countries. In a recent study (Barwick et al. 2018), we conduct one of the first national-level analyses of the impact of air pollution on health spending in a developing country context. Our study provides a lower bound estimate of Chinese consumers’ willingness-to-pay for improved air quality, which can be used as an input for the cost-benefit analysis of environmental regulations. The empirical estimates leverage comprehensive hourly air pollution readings from all monitoring stations in China from 2013 to 2015, and health expenditure from credit card and debit card transactions in China during the same period. These transactions accounted for 50% of private health expenditures in 2015. 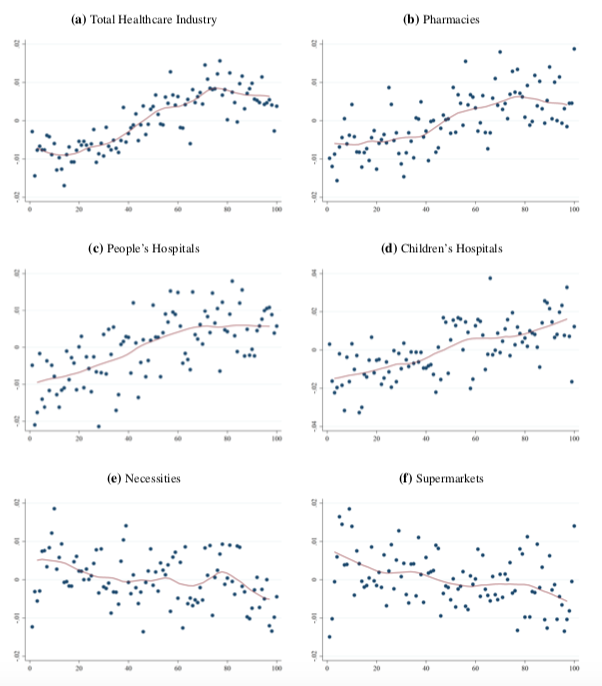 Figure 2 shows the positive correlation between spending, within the same day, in health care categories and air pollution, after removing baseline differences in both spending and air pollution across cities. In contrast, there is a negative correlation between air pollution and spending on necessities and at supermarkets, suggesting that consumers stay indoors during polluted days. To establish a causal relationship between air pollution and spending, we make use of the fact that a large share of PM2.5 in any given city comes from non-local sources, due to its long-range transport property. Exploiting weather data on wind speed and direction, we construct for each city the amount of pollution that is imported from other areas (Figure 3). The weather conditions elsewhereserve as an exogenous shock tolocalpollution in our quasi-experimental research design. In Beijing, for example, about half of PM2.5 during non-warm seasons originates from surrounding industrial cities, and the share varies depending on the weather conditions such as wind direction and speed. Notes: Each arrow’s width indicates the level of PM2.5 concentration of the origin city. Length of the arrow captures wind speed, rescaled to match the distance that pollutants would travel in a day. Directionof the arrow indicates the direction to which the wind blows from the origin. Utilising the exogenous shocks from non-local weather conditions, we then estimate the medium-run impact of PM2.5 on health spending using a flexible distributed-lag model. We find that health spending increases significantly during the first two months post exposure to air pollution, with a 2.65% rise in health spending for a 10 μg/m3 increase in PM2.5 concentration. These findings are robust and survive the inclusion of a host of explanatory variables to control for confounding factors. Figure 4 depicts the time path of the estimated causal impact on health spending from a 10 μg/m3 increase in PM2.5. Solid segments of the line indicate statistical significance at the 5% level. Only 23% of the higher spending occurs in the first week after exposure. Most of the spending increase materialises over the course of two to three months. This is consistent with the fact that the health impact of pollution is persistent. Particularly worrisome is that spending in children’s hospitals is two to three times more sensitive to pollution than that of other health categories – children are among the most vulnerable to air pollution. 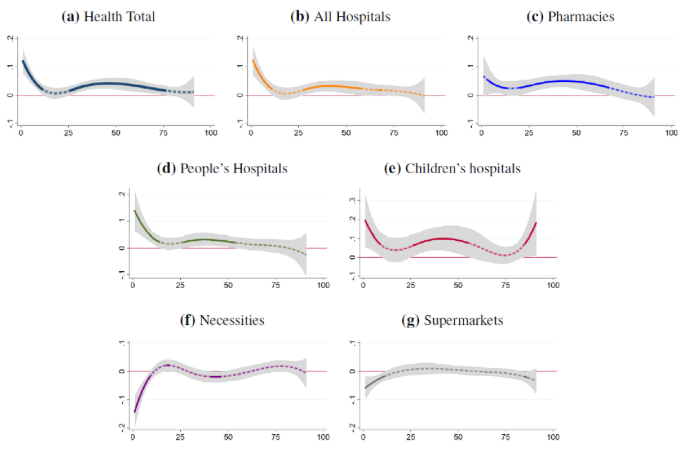 Finally, we also find a negative impact of PM2.5 on non-healthcare spending in the short-term, suggesting that consumers alter their activities (e.g. staying indoors more) in response to elevated air pollution. Pollution is extremely costly. Given the sheer size of China’s national health care expenditures, a 10 μg/m3 increase in PM2.5 concentration leads to a 60 billion yuan ($9 billion) increase in annual health spending. This estimated impact does not include the costs associated with loss in productivity and reduced quality of life, and only provides a lower bound for the true social cost. The Chinese central government spent five billion yuan in 2013 and ten billion in 2014 on reducing air pollution. The National Plan on Air Pollution Control, developed for the first time as a national policy by the State Council in 2013, sets a goal of reducing PM2.5 by 25%, 20%, and 15% in Beijing-Tianjin-Hebei, the Yangtze River Delta, and the Pearl River Delta regions, respectively, in 2017 relative to the 2012 levels. These regions account for 5% of the land area but 23% of the population and 40% of national output. Our findings suggest that these targeted reductions would generate significant health spending savings and substantial economic benefits. Barwick, P J, S Li, D Rao, N Bin Zahur (2018), “The morbidity cost of air pollution: Evidence from consumer spending in China”, NBER Working Paper. Brunekreef, B, and ST Holgate (2002). “Air pollution and health”. The Lancet, 360(9341): 1233-1242. Pope III, CA and DW Dockery (2006), “Health effects of fine particulate air pollution: Lines that connect”. Journal of the Air & Waste Management Association, 56(6): 709-742. Dockery, DW (2009), “Health effects of particulate air pollution”. Annals of Epidemiology, 19(4): 257-263.
WHO (2016), WHO Global Urban Ambient Air Pollution Database (2016 update).